Appointments are by prior arrangement only, so please email or call me to set up a meeting. Application deadlines vary with the study program. In general, you can only apply for the winter semester; applications for the summer semester are only possible for certain Master’s programs and for higher regular semesters. You can find the exact dates on the Application Deadlines web page. Should I also use C@MPUS to apply to open admission study programs? Yes. Even when your intended study program has no minimum admission requirements and no entrance exam, you must complete the online application in C@MPUS. What is the Dialog Oriented Service Process (DoSV) and what does it require? The DoSV is a Federal Republic-wide admissions process coordinated by the Foundation for University Admissions via its hochschulstart.de [de] website. It prevents study program places from remaining unused. You can find out which study programs it affects and what you need be aware of on the Dialogue Oriented Service Process [de]. Applicants from non-EU countries and without German university entrance qualification don't have to apply via DoSV but via C@MPUS only! Can I apply for multiple study programs simultaneously at the University of Stuttgart? A total of three simultaneous applications are allowed, both to study programs that are covered by the Dialogue Oriented Service Process (DoSV) as well as those with minimum admission requirements that you apply for exclusively on C@MPUS. If you are not sure you can get into your preferred restricted-entry course and you have an open admissions alternative, we recommend that you also apply for the latter. In this way, you will at least have a place even if you are not admitted to your preferred study program. What subjects can I combine? You can combine different subjects only in the Bachelor of Arts study programs (combination Bachelor’s) and in the teaching qualification study programs. 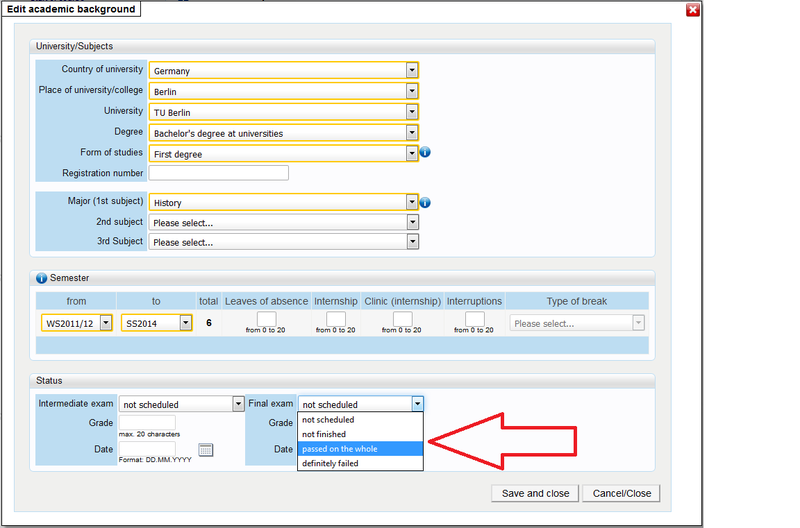 You can see the permitted subject combinations on the web pages for two-subject Bachelor of Arts with combination options and for subject combinations in teaching qualification study programs. Can I apply even if I only have a provisional school leaving certificate? As a rule, the certificate of eligibility for entry into higher education must be submitted with the application. If – and if so, with what conditions – one of the rare exceptions is to be made for an applicant with a temporary certificate, it will be decided on a case-by-case basis by the Admissions Office. If the exception is granted, the certificates must be presented latest at the time of enrollment. However, this only applies if the required completion – i.e., of the eligibility for entry into higher education – is attained in time before the application deadline. Do I need evidence of an orientation proceeding when changing study programs or universities? All applicants, including those changing study programs or universities, must enclose evidence of having attended an orientation even if only applying for one subject for the 1st regular semester. Which proceedings are acceptable to the University of Stuttgart is detailed for you on the Orientation process. Do I have to apply online or can I submit my application on paper? You must use the online application via C@MPUS for all study programs. Paper format applications are no longer accepted. Can I already apply for this semester if I will be performing Voluntary Service? If you are or will be performing Voluntary Service, we recommend that you apply when starting your service. Under the current rules, you will be granted preferential admission during the next two application periods for the same study program over all other applicants (so-called advance selection). If, however, in the intervening time an entrance examination is introduced or modified, you must also take it. For more details, see the web page for Application during (volunteer) service. By when must I complete my pre-university internship and what if I can’t finish an internship on time? Evidence of having completed the pre-university internship must be furnished either at enrollment or to the Placement Office at the start of classes. On an exceptional basis, the internship can also be completed at a later time. For the detailed internship rules, please consult your study program’s information web pages. Should you run into difficulty finishing your internship before starting your studies or have problems finding an internship, please be sure to contact the Internship Office. Do I have to do anything special if I’m still under the age of 18 when applying? As soon as you are in possession of certification of eligibility for entry to university studies, i.e., you have graduated, you are judged capable of “taking up, pursuing, and completing studies” even if you are a minor. That means that even if still under the age of 18, you have the right to sign your application, enroll at the University, and enjoy the same rights as all other students. The same applies if you want sit for a Delta examination or take an assessment test for the vocationally qualified. Who do I contact if I experience technical difficulties? Why is the “submit“ button not working? You first need to click the checkbox at the bottom of the splash page (the checkbox is located next to the text that starts with “I confirm that the statements made by me are truthful…”) The “submit” button will now work. Where can I locate the Application for Admission and where do I upload it to? Please go to the application overview and there click on “Show application status” (the first link under “Actions.”) On the page that opens, click on “Print Application for Admission” to print out the form. How can I correct an error I made on the application? Once you have submitted your application, only minor changes can be made in C@MPUS. If you need to change personal data (such as nationality) send an email with the changes to the Admissions Office. We will then effect the necessary changes to your data. You can reset your password on your own in C@MPUS using your stored security question and email address. If you run into difficulties, contact the Admissions Office hotline at 0711/685-83644 or email the Admissions Office. You can reset your password on the User Admin web page. You can obtain your username for student services (“TIK Account” st123456@stud.uni-stuttgart.de) from Student User Support. How do I turn my documents in various formats into one pdf file? C@MPUS from time to time may ask you to upload several documents combined into one. In that case, use one of the many available freeware program for creating pdf files, such as pdf24 Creator or FreePDF. File uploads may not exceed 2 MB regardless of document format. If you file exceeds the limit, we will ask you to scan it again at a lower resolution. It is possible to reduce your pdf file’s size online, with apps like Smallpdf. Please do not send us large files via email! Where do I upload the language certificate for English or German (IELTS/TOEFL, TestDaF)? Please go to “Language Certificate (EN/DE oder DE/EN)“ to upload it as a pdf file. I withdrew my application by mistake. How do I re-submit it? Please contact the Admissions Office handling your application for help with this. Do I have to upload a CV? The message "This study program requires previous academic qualification." appears. To apply for a master's program, you need to have a respective academic background. Please note that at least one final exam (Bachelor’s degree) of the academic background needs to be “passed on the whole” or “not finished” in order to continue with your application. How soon do I have to enroll after being accepted? You must enroll by the date stipulated in your acceptance letter. You can download the letter once you have accepted your study place in C@MPUS. How do I check the conditions of my acceptance? The conditions of your acceptance are listed in your letter of acceptance which you can download in C@MPUS. Can I de-register or rescind my enrollment if I have been accepted by another university and want to switch? You will find the necessary information on what to do on the De-registration web page. How to enroll in a Master’s study program with my conditional acceptance? If you already have been accepted with conditions for a Master’s study program and want to enroll in it, please follow the steps shown on the Enrollment web page. When do I receive my certificate of enrollment? It is up to you when to download your certificate of enrollment in C@MPUS using the link you will receive for your new student account after enrollment is complete and you have activated it in a timely manner. You are then ready to download your certificate of enrollment from this account. A few days later, you will receive your student ID card ECUS by regular mail; it also serves as your library card. Next to my application in C@MPUS it says “Admission requirements not met.” Where can I find out why? Unfortunately, you cannot call up more precise information in C@MPUS in this regard. In the following few weeks, you will receive a rejection notice that will state the reason for turning down your application. If warranted, on this basis you can then appeal the admission committee‘s decision. You are welcome to make an appointment with Student Counseling Center to discuss the rejection notice and review your options. I paid the semester fees; why don’t I have access to C@MPUS yet? At the present time, it unfortunately takes about two weeks before the funds are received from the State Bank by the bursar’s office of the University of Stuttgart and transmitted via the SAP-FI interface to C@MPUS. How do I get the VVS Public Transit StudiTicket for the semester? After enrolling, you can order the semester ticket online from VVS. For more information, see the StudiTicket web page. How does enrollment by proxy work? You must draft and sign an informal letter authorizing the other person to take care of the enrollment for you. S/he must bring it to the Admissions Office along with her/his personal ID as well a copy of your ID for signature authentication.